Problem and Solution is a pattern of organization where information in a passage is expressed as a dilemma or concerning issue (a problem) and something that was, can be, or should be done to remedy this issue (solution or attempted solution). The problem and solution text structure may seem like it would be easy to recognize, but it can be moderately difficult to identify because it is frequently confused with the cause and effect pattern of organization, as they both have relational structures; however, if you read the passage and look specifically for both a problem and a solution to the problem, you should find it pretty easy to distinguish from cause and effect, as cause and effect passages do not propose solutions to any negative occurrences within the passage but rather just explain why or how they happen. Example: It seems like there has been a surge in teen pregnancies these days. Teen pregnancies make it very difficult for young mothers to pursue their dreams and meet the demands of an infant. Fortunately, most teen pregnancies can be easily prevented by using birth control; however, even birth control is not 100% effective. The most effective way to prevent teen pregnancies is abstinence, which is 100% effective. 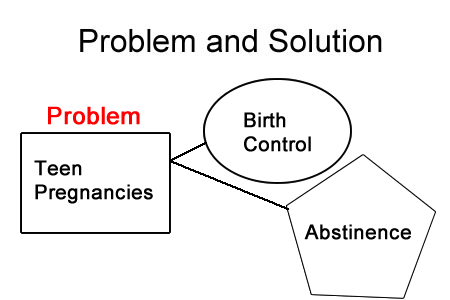 Problem and Solution: Proposed solutions to teen pregnancies. There are also a few signal words which may indicate that information in a passage is ordered in the problem and solution pattern of organization: propose, solution, answer, issue, problem, problematic, remedy, prevention, and fix. Nice website. It’s a big help in my coming English proficiency test. You got me… and yourself. WTG! Can I copy and paste this? Can you, or should you? What is the main function of this? Great for doing research on text structures. Crazy people always bothering this poor man. i understand ur information and i got some ideas. your research are good approch and we understanding from your literture for next time more wide information gather to input utilized.